It’s been three years since my last first day of school, but every August I still sleep restlessly the night before it all starts again. I just can’t seem to shake the feeling that I’m going to be tardy for class the next morning. This year, that feeling was exacerbated by the promise of waking up to a new job, but going to bed remembering where I was just one year ago — in a city that moved even faster than I imagined and left me dazed and adrift. I can officially say that this year served as my quarter-life crisis. Reading over the blog posts I wrote in high school, I can see how the seeds were sown years earlier. A girl so eager to bust out of where she was that she forgot to stop and take a look around at what she might already have. And I’d been on that trajectory ever since, hurling toward a life I thought I wanted, of working hard and playing hard and collecting stories and battle scars along the way. As it turns out, I’ve managed to assemble quite a good collection since coming home. The pace is better for me here. And, lucky for you, I have plenty of time to invest in things that I love… like baking tarts. 2) Divide the dough in two and create two balls of dough. Wrap with plastic and compress into disks. Refrigerate for 1 hour. Note: This recipe makes enough to fill one tart. Double the recipe if you want two! 1) Preheat the oven to 375 degrees. Remove one of the tart dough sections from the fridge and roll into a circle with a rolling pin until the dough is about 12 inches in diameter. Place on a cookie sheet lined with parchment paper or a Silpat and refrigerate for 10 minutes. 2) Combine the goat cheese, a few of the basil leaves, salt and pepper, then spread over the chilled tart, leaving a border of 1 and 1/2 inches. Place the tomatoes evenly across the goat cheese. Sprinkle with garlic and drizzle with olive oil. 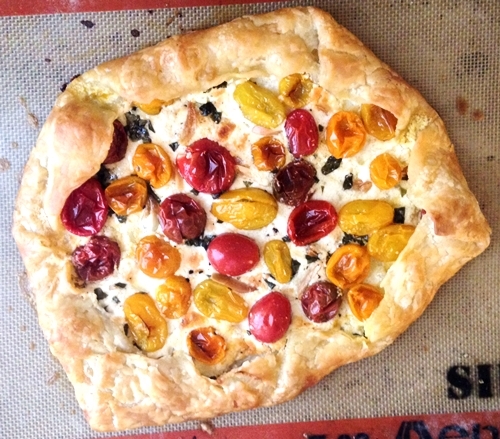 3) Fold the border over the cheese and tomatoes to make a crust. Mix the egg and water together and brush gently over the crust. Place the tart on the lower rack in the oven and cook for 45 to 55 minutes until the crust is golden brown. 2) Heat a pan over medium heat with the butter. Once melted, add mushrooms and cook until softened and browning, about 10 minutes. Add rosemary, salt and pepper and cook for another 2 minutes. Turn off heat and set aside. 3) Remove tart dough from the fridge and spread with mascarpone cheese. Top with mushroom mixture, then arrange the asparagus on top. Sprinkle with garlic, then drizzle with olive oil. 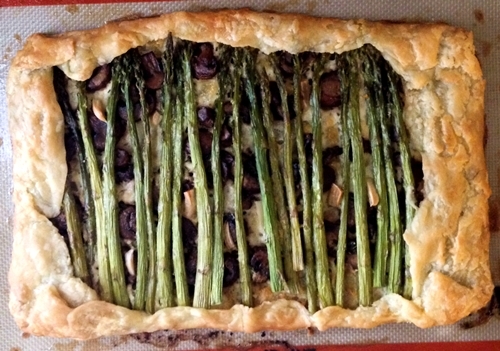 4) Fold the border over the cheese and asparagus to make a crust. Mix the egg and water together and brush gently over the crust. Place the tart on the lower rack in the oven and cook for 45 to 55 minutes until the crust is golden brown. 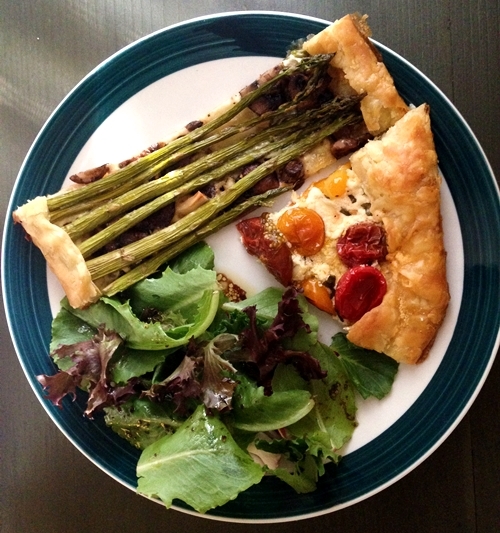 This entry was posted in pastry, vegetarian and tagged asparagus, basil, cheese, garlic, goat cheese, mushrooms, tomatoes. Bookmark the permalink.